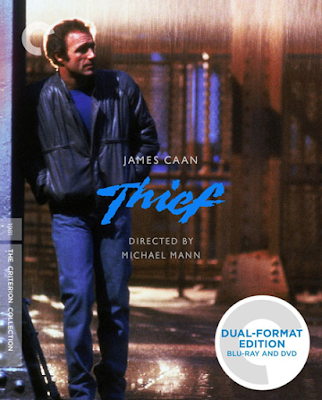 Lee Pfeiffer at cinemaretro.com offers a review of Michael Mann’s Thief, which has been released in DVD. Criterion has released a dual format Blu-ray/DVD edition of director Michael Mann's 1981 crime thriller Thief starring James Caan. It's a highly impressive film on many levels, especially when one considers this was Mann's big screen feature debut. He had previously directed the acclaimed 1979 TV movie The Jericho Mile, which was set in Folsom Prison. Mann was inspired by his interaction with the world of convicts and wrote the screenplay for Thief, which is credited as being based on author Frank Hohimer's novel The Home Invaders, but he maintains virtually none of the source material ended up on screen. The story centers on Frank (James Caan), a bitter man with a troubled past. As a child he was raised in state-run homes before being sent to jail for a petty crime. Inside prison, he committed violent acts in order to defend himself but this only resulted in lengthier jail terms. By the time he has been released, he has spent half of his life behind bars. While in jail, Frank befriended Okla (Willie Nelson), a older man and master thief who is doing a life sentence. He becomes Frank's mentor and father figure and teaches him the tools of the trade. When Frank is finally released, he becomes a master at his craft, which is pulling off seemingly impossible heists of cash and diamonds. Before long, he has become a legend in his field. As a cover, Frank runs a major used car dealership and a small bar. However, he realizes that his luck will certainly run out at some point and he is determined to retire after making a few more high end scores. He works with a small team consisting of two confederates (James Belushi, Willam LaValley) who are also pros in gaining access to seemingly impenetrable vaults. The headstrong Frank wants to also settle down and raise a family. He makes an awkward introduction to Jessie (Tuesday Weld), an equally head strong, down-on-her luck character who nevertheless becomes smitten by him and ends up marrying him. The couple face frustration, however, when their attempts to adopt a baby are thwarted by Frank's criminal record. Frank is ultimately approached by Leo (Robert Prosky), a local crime lord who entices him to stop working independently and pull off a high profile heist for a fortune in diamonds.